LE MANS, France - Corvette and Aston Martin went toe-to-toe in the 24 Hours of Le Mans, trading blows through a grueling day and night of racing. When the battle finally ended at 5 p.m. today, Corvette Racing had won the GT1 class in the world's greatest sports car race for the fifth time in six years. The victorious No. 64 Compuware Corvette C6.R driven by Oliver Gavin, Olivier Beretta and Jan Magnussen finished fourth overall and scored Corvette Racing's 12th podium finish since the team first came to Le Mans in 2000. It was the trio's third consecutive class victory at Le Mans and their fourth straight endurance racing win, a streak that includes last year's 24 Hours of Le Mans, Petit Le Mans and the 12 Hours of Sebring. Corvette Racing extended its perfect finishing record in the 24 Hours of Le Mans to seven consecutive years and Corvette became the winningest manufacturer in recent GT history at Le Mans. This year's 24-hour endurance test reprised the drama of last year's battle. The No. 63 Corvette C6.R and the No. 009 Aston Martin DBR9 were in lockstep from the start, separated by less than a lap in the running order for hour after hour. The turning point came in the 22nd hour when the green Aston Martin went to the garage with a mechanical problem. At 2:09 p.m., Jan Magnussen officially took the lead - a lead that Corvette Racing would not relinquish. The winning Corvette completed 355 laps, made 25 faultless pit stops, and won by a five-lap margin of victory. "You have a one-lap cushion, the Aston is in the garage, and you are five laps ahead of the next car," crew chief Ray Gongla radioed Magnussen when he took the point. "Do you copy? Can you hear us?" "Yes, I can hear you," the Dane replied, "but I just can't believe it!" Joining the three Corvette Racing drivers on the victory podium were Luc Alphand, Patrice Goueslard and Jerome Policand, who finished third in their independent Corvette C5-R with 346 laps completed. The No. 63 Compuware Corvette C6.R of Ron Fellows, Johnny O'Connell and Max Papis finished seventh after encountering drivetrain problems. 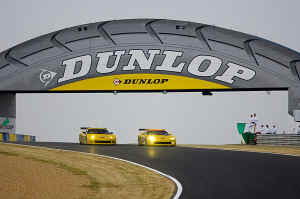 Just as last year, Corvette Racing put its rival under pressure in the closing stages of the race. When a setback during a safety car period cost the team valuable track position, Gavin, Beretta and Magnussen resolutely began to chase down the leader, trimming seconds from the Aston Martin's margin throughout each stint. "It was an epic battle between two great warriors," said Corvette Racing program manager Doug Fehan. "We've yet to come upon competition that can provide us the spirit of racing such as the Aston Martin Prodrive team. It's just sad that only one team could win. We put on a hell of a show." The No. 63 Corvette's star-crossed weekend continued when it pitted at 1:20 p.m. in a cloud of smoke from the transmission. The crews from both cars went to work, removing, rebuilding and reinstalling the overheated gearbox. One hour and nine minutes later, Johnny O'Connell rejoined the fray. "The rules don't allow you to replace the complete transmission, but you can rebuild it," explained team manager Gary Pratt. "We had a gearbox issue in Sebring, but we didn't expect it here, and it might have been the result of one problem creating another problem." "What those guys did was unbelievable," said Pratt. "Teamwork is what it's all about. Whichever car wins, the whole team wins." Olivier Beretta: "The key to our success was to never give up. Once again Le Mans proved to be a race that isn't won until the checkered flag is out. We had a difficult moment during the night when Ollie hit an LMP car and we subsequently got some vibrations. Then we had a refueling problem and all of a sudden we were almost a lap down. We then could sit back and give up, or push and see if the race could come back to us. We decided to push and a couple of hours from the end we started biting big chunks out of their lead. Then they hit problems and the race fell back our way. This third consecutive GT win is the combined work of a very dedicated crew of mechanics, top-class engineers and visionary decision makers. I can't wait to come back for more in 2007!" Oliver Gavin: "As always it was a fantastic race, super hard all the way against the Aston Martins. And once again everybody dug deep. This race is a testament to everybody involved who has worked so hard. It's been a truly remarkable result to win three in a row against a super professional team like Prodrive. There were moments when you thought, this is going to be tough, when you felt the race falling away from you, but we just hung in there until it came back to us." Jan Magnussen: "It was a very tough race, all 24 hours of it. We pushed all the way, and after we hit problems we didn't sit back. We didn't want the race to run away from us. By daylight we were almost a lap down but we just kept pushing and pushing until the Astons failed, and eventually they did. We never got any presents, we earned this win!" Johnny O'Connell: "This is the hardest race in the world, and you run two cars in case something happens to one of them. Today gives me more motivation for the rest of this season and to come back to Le Mans next year. I'm so proud of everyone on the No. 63 Corvette C6.R, and everyone at Corvette Racing. The effort they put in is unreal. The guys in the 64 car are continuing their amazing run of good results, and if Ron and I are going to beat them, we're going to have to do everything right. This is a very special time in Corvette history - five Le Mans wins in six years is an incredible record against very stiff competition." Max Papis: "Today the No. 63 car showed the team spirit of Corvette Racing. We fought hard, it wasn't our day, but it was the No. 64's day and a Corvette day. When you fight this hard, when the win comes it's going to be sweeter. With Olivier, Jan and Oliver winning, I feel I have a little part in it because we all contribute to the effort. Hats off to them."